Holy History, Batman! The Origin of Dynamic Duo! I assumed that the term dynamic duo must come out of comics. Comic book creators have long been coming up with alliterative epithets for their characters. Superman is the “Big Blue Boy Scout”, Supergirl is the “Maid of Might”, Batman is the “Caped Crusader”, Silver Surfer is the “Sentinel of the Spaceways”, Flash is the “Scarlet Speedster”, Wonder Woman is the “Amazing Amazon”, Spider-man is spectacular, the Avengers are (also) amazing, and the Four are fantastic. You get the point. But having been around the etymological block a few times, I know that everything in language is older than you think it is. So I thought the phrase dynamic duo might come out of some earlier work. Perhaps it was reappropriated by comic book authors to describe the Dark Knight and the Boy Wonder. Various dictionaries, however, claim that dynamic duo comes from the famous 1960s Batman TV series starring Adam West and Burt Ward, including NTC’s Dictionary of American Slang and Colloquial Expressions by Richard Spears and the Dictionary of American Slang by Kipfer and Chapman. The Batman TV series premiered in 1966, or 25 years after Robin was created. I found it hard to believe that it would have taken writers that long to come up with dynamic duo, so I decided to dig a little deeper. So dynamic duo predates the Batman TV show. But when was it first applied to Batman and Robin? For that we have to dive into the comics. Of course, the term has moved out of the comics and can be applied to any “very special pair of people or things” (Spears 2000). And it may still be true that the Batman TV show is responsible for popularizing the term. But it warms my comic book loving heart to know that Bill Finger came up with dynamic duo. Holy exciting etymology, Batman! It’s time to update our Bat-tionaries! [Update – Jan. 8, 2018] Holy cats, Batman! Foiled again! Thanks to commenter Jack Smith below, we now know that the term dynamic duo goes back to at least 1910. I don’t know how I missed this one. It was used in an article (or op-ed?) 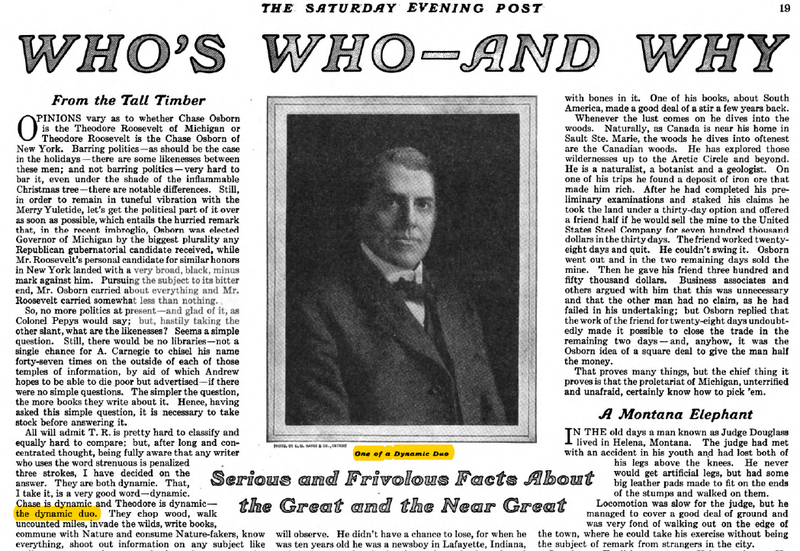 titled “Who’s Who – And Why” in the Saturday Evening Post, vol. 183, is. 2. I couldn’t find out the writer’s name, but the article is from thirty years before Bill Finger used dynamic duo in the pages on BATMAN. 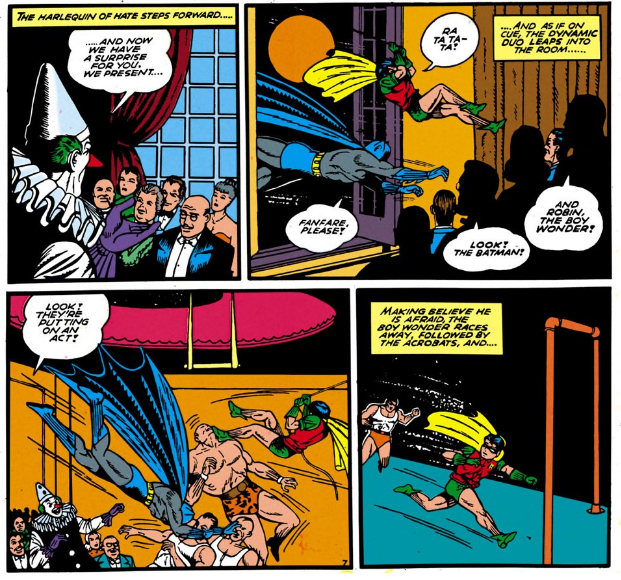 Heck, it’s from four years before Bill Finger was even born! You can see a screenshot of the page below, but you should really go check out the article here. It’s fascinating. As it turns out, the original dynamic duo were politicians Theodore Roosevelt and Chase Osborn. So there you have it – proof that the 26th president of the United States and the 27th governor of Michigan swung from rooftops at night and brought justice to the city. Fact. The Saturday Evening Post article from 1910 which uses “dynamic duo”. in google books is from the Saturday Evening Post in 1910.